Zugzwang's First Move is a Tactical type weapon. It is an upgraded version of Zugzwang's Last Move. 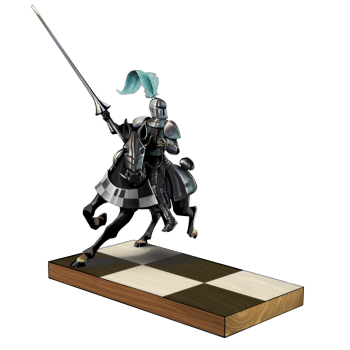 The chess pieces of Zugzwang's Last Move have been reborn with the help of a magic feather, becoming a powerful knight who will defend your cheese to the death. Using strategy gleaned from his origins as a chess set, and a stubbornness that can only come from being made of stone, he will fight off any rodent attacker in the name of his King or Queen. Zugzwang's First Move is not sold by any Trapsmith. It can only be crafted given the proper ingredients. Zugzwang's Last Move - Source of Chess Pieces for crafting. 17 August 2010: The Zugzwang's First Move was introduced with the release of the Seasonal Garden. The name of Zugzwang's First Move comes from the term zugzwang which, in the game of chess, is when a player must move into a disadvantageous position. This page was last edited on 27 January 2019, at 01:08.